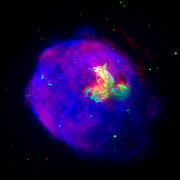 The supernova remnant N 63A is a member of N 63, a star-forming region in the Large Magellanic Cloud (LMC). Visible from the southern hemisphere, the LMC is an irregular galaxy lying 160,000 light-years from our own Milky Way galaxy. 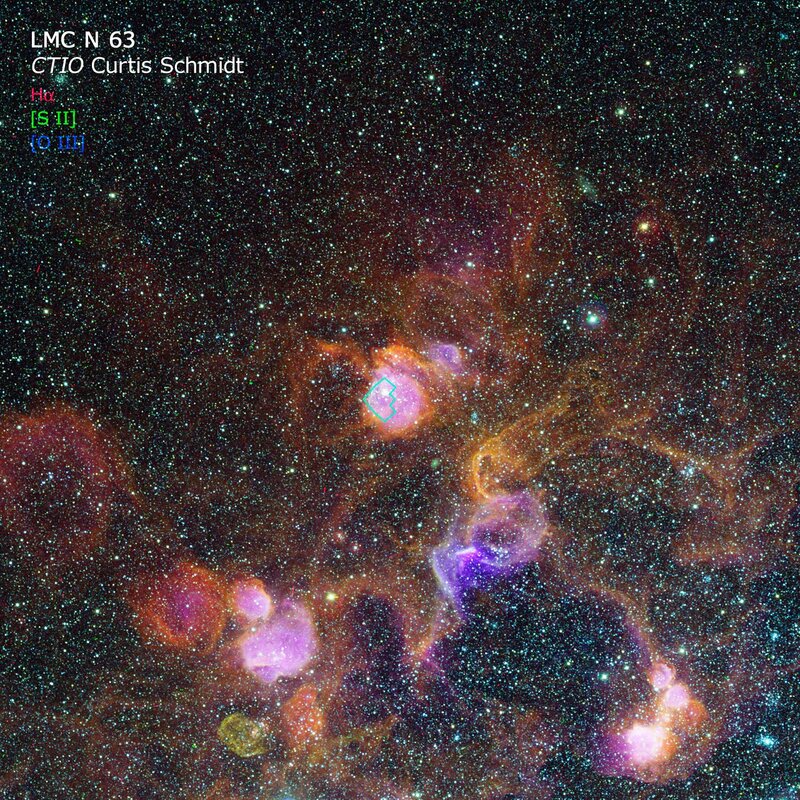 The LMC provides excellent examples of active star formation and supernova remnants, many of which have been studied with Hubble. 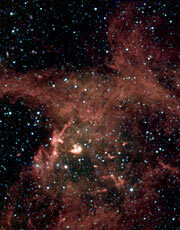 Numerous of the stars in the immediate vicinity of N 63A are extremely massive. It is estimated that the 'mother-star', or progenitor, of the supernova that produced the remnant seen here was about 50 times more massive than our own Sun. 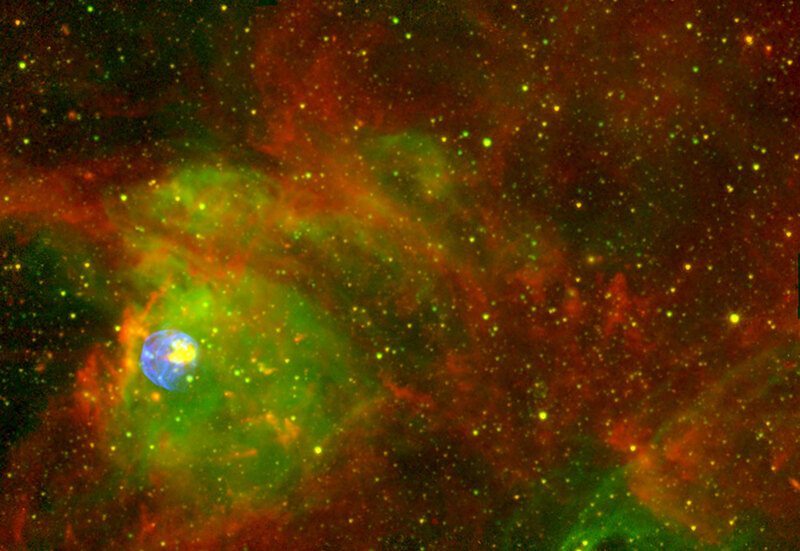 Such a massive star has strong stellar winds that can clear away the gas around it and form a wind-blown bubble. 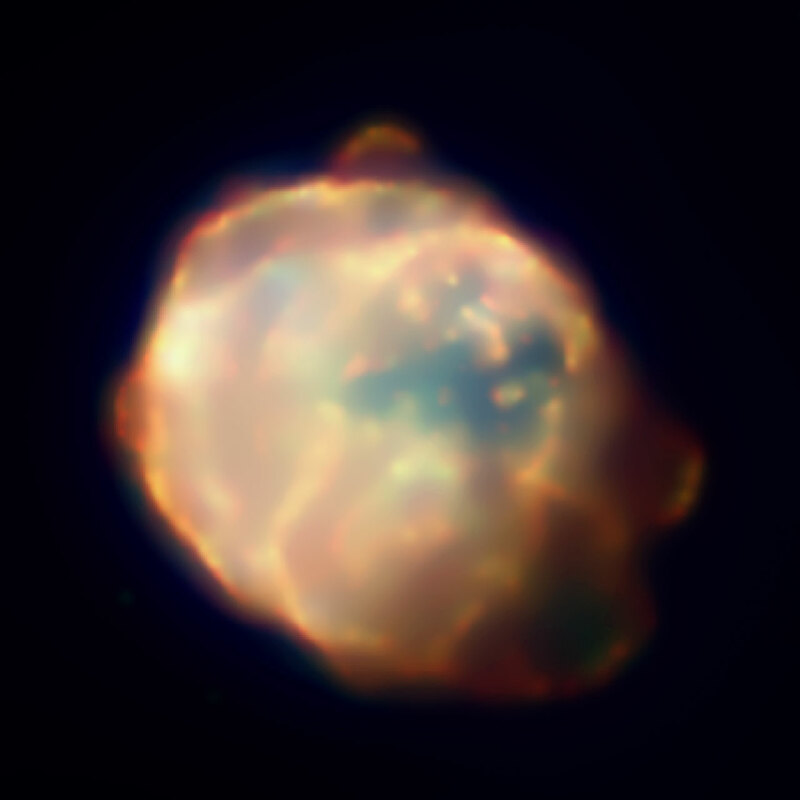 The supernova that formed N 63A is thought to have exploded inside the central cavity of such a wind-blown bubble, which was itself embedded in a clumpy portion of the LMC's interstellar medium. Images in the infrared, X-ray, and radio emission of this supernova remnant show the much more expanded bubble that totally encompasses the optical emission seen by Hubble. Odd-shaped mini-clouds or cloudlets that were too dense for the stellar wind to clear away are now engulfed in the bubble interior. The supernova generated a propagating shock wave, that continues to move rapidly through the low-density bubble interior, and shocks these cloudlets, shredding them fiercely. 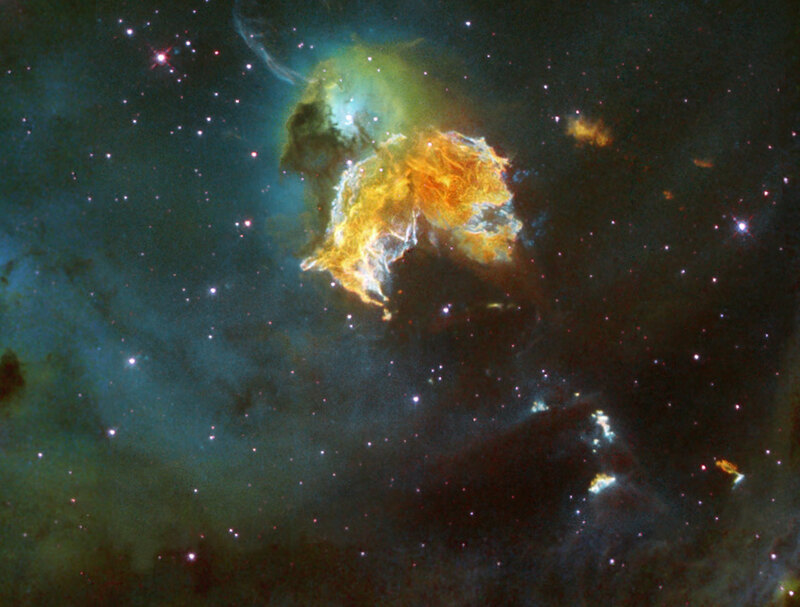 Supernova remnants have long been thought to set off episodes of star formation when their expanding shock encounters nearby gas. As the Hubble images have illustrated, N 63A is still young and its ruthless shocks destroy the ambient gas clouds, rather than coercing them to collapse and form stars. Data obtained at various wavelengths from other detectors reveal on-going formation of stars at 10-15 light-years from N 63A. In a few million years, the supernova ejecta from N 63A would reach this star-formation site and may be incorporated into the formation of planets around solar-type stars there, much like the early history of the solar system. The Hubble image of N 63A is a colour representation of data taken in 1997 and 2000 with Hubble's Wide Field Planetary Camera 2. Colour filters were used to sample light emitted by oxygen (shown in blue), hydrogen (shown in green) and sulphur (shown in red).